Banks Ram-Air® Superiority. Flowbench developed, dyno proven. Improves airflow 31%. Enclosed housing keeps out hot, power-robbing engine air. Easy filter access for monitoring & cleaning. Easy install; reusable filter is easy to access for monitoring and cleaning. (By contrast, the stock filter is difficult to access, not reusable, and when dirty, requires replacement of the whole expensive unit!) Lifetime Limited Warranty on filter element. Unit is triple validated before the name "Banks" is stamped on. We test; the other guys don't. That's the Banks difference! 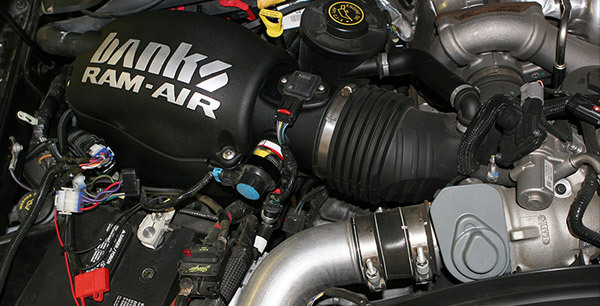 gets Banks Power for his 6.4L, watch here.